NHS Highland has taken the next step towards creating a £15 million community hospital in Aviemore after purchasing the land from the previous owner. 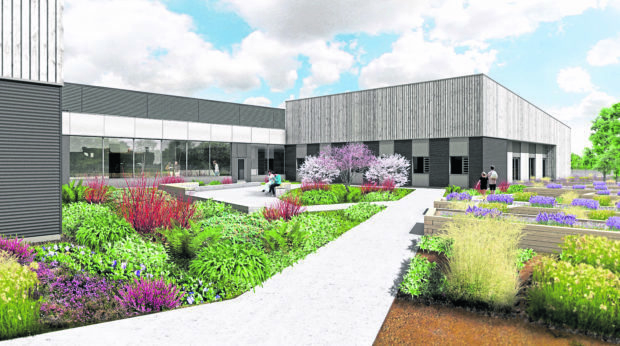 The land, located to the south of the former call centre at Technology Park, will be the new home for the proposed Badenoch and Strathspey community hospital which aims to redesign the delivery of health and social care services in the region. The health board purchased the site – which stretches more than 9 acres – for £550,000 from the previous land owner. NHS Highland’s project director for the redesign, Georgia Haire, said: “This is another exciting step and signals we are at an advanced stage of the redesign. I wish to thank the local communities for their patience throughout the final stages of the land purchase. A total of 24 inpatient beds will be provided to accompany 12 consultation and treatment rooms, three minor injuries and out-of-hours treatment rooms, X-ray facilities and an outpatient department which includes six consulting and clinic rooms, a group therapy room and dental treatment rooms. Paramedics will also be based at the new facility, alongside doctors from Aviemore Medical Practice. A transport system will also be created at the entrance to the facility, to provide vital transport links to commuting passengers and visitors, with electronic bus timetable information being posted both inside and outside the building. Convenor of Highland Council and chairman of Badenoch and Strathspey Area Committee Bill Lobban welcomed the land purchase completion. The plans will now be put forward for consideration to both Cairngorm National Park planning committee and the Scottish Government.